Canada ( pronounced /'kænədə/ in English and /kanadɑ/ in Canadian French) is the world's second-largest country by total area, occupying most of northern North America. Extending from the Atlantic Ocean to the Pacific Ocean and northward into the Arctic Ocean, Canada shares land borders with the United States to the south and to the northwest. 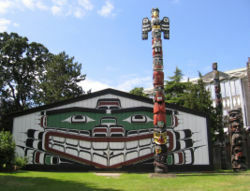 Inhabited first by Aboriginal peoples, Canada was founded as a union of British and former French colonies. Canada gained independence from the United Kingdom in an incremental process that began in 1867 and ended in 1982. Canada is a federal constitutional monarchy with a parliamentary democracy. Comprising ten provinces and three territories, Canada is a bilingual and multicultural nation, with both English and French as official languages at the federal level. A technologically advanced and industrialized nation, Canada maintains a diversified economy heavily reliant on trade—particularly with the United States, with which Canada has had a long and complex relationship—and abundant natural resources. The name Canada comes from a First Nations word, kanata, meaning "village" or "settlement". In 1535, inhabitants of the area near present-day Quebec City used the word to direct Jacques Cartier towards the village of Stadacona. Cartier used the word 'Canada' to refer to not only that village, but the entire area subject to Donnacona, Chief at Stadacona; by 1547, maps began referring to this and the surrounding area as Canada. The French colony of Canada, New France, was set up along the Saint Lawrence River and the northern shores of the Great Lakes. Later, it was split into two British colonies, called Upper Canada and Lower Canada until their union as the British Province of Canada in 1841. Upon Confederation in 1867, the name Canada was officially adopted for the new dominion, which was referred to as the Dominion of Canada until the 1950s. As Canada increasingly acquired political authority and autonomy from Britain, the federal government increasingly simply used Canada on state documents and treaties. The Canada Act 1982 refers only to "Canada" and, as such, it is currently the only legal (and bilingual) name. This was reflected again in 1982 with the renaming of the national holiday from Dominion Day to Canada Day. Aboriginal tradition holds that the First Peoples inhabited parts of Canada for a very long time, and some archaeological studies support human presence in northern Yukon to 26,500 years ago, and in southern Ontario to 9,500 years ago. Europeans first arrived when the Vikings settled briefly at L'Anse aux Meadows circa AD 1000. The next Europeans to explore Canada's Atlantic coast included John Cabot in 1497 and Martin Frobisher in 1576, for England; and Jacques Cartier in 1534 and Samuel de Champlain in 1603, for France. The first permanent European settlements were established by the French at Port Royal in 1605 and Quebec City in 1608, and by the English in Newfoundland, around 1610. European explorers and trappers unwittingly brought diseases that spread rapidly through native trade routes and decimated the Aboriginal population. The Death of General Wolfe, painted by Benjamin West, depicts British General Wolfe's death after his victory at the Battle of the Plains of Abraham in 1759. Evolution of the borders and names of Canada's provinces and territories. For much of the seventeenth century, the English and French colonies in North America were able to develop in relative isolation from each other. French colonists extensively settled the St. Lawrence River valley, while English colonists largely settled in the Thirteen Colonies to the south. However, as competition for territory, naval bases, furs and fish escalated, several wars broke out between the French, English and Native tribes. The French and Iroquois Wars erupted between the Iroquois Confederation and the Algonquin, with their French allies, over control of the fur trade. A series of four French and Indian Wars were fought between 1689 and 1763; these culminated with a complete British victory in the Seven Years' War. By the terms of Treaty of Paris in 1763, Britain gained control of all of France's North American territory east of the Mississippi River, except for the remote islands of St. Pierre and Miquelon. Following the war, the British found themselves in possession of a mostly French-speaking, Roman Catholic territory, whose inhabitants had recently taken up arms against Britain. To avert conflict, Britain passed the Quebec Act of 1774, re-establishing the French language, Catholic faith, and French civil law in Quebec. The act had unforseen consequences for Britain, however, as it angered many residents of the Thirteen Colonies, helping to fuel the American Revolution. Following the independence of the United States, approximately 50,000 United Empire Loyalists moved to Quebec, Nova Scotia, Prince Edward Island and Newfoundland. As they were unwelcome in Nova Scotia, New Brunswick was carved out of that colony for them in 1784. To accommodate the English-speaking Loyalists in Quebec, the province was divided into francophone Lower Canada and anglophone Upper Canada under the Constitutional Act in 1791. Canada was a major front in the War of 1812 between the United States and British Empire and its successful defence had important long-term effects on Canada, including the building of a sense of unity and nationalism among British North Americans. Large-scale immigration to Canada began in 1815 from Britain and Ireland. A series of agreements led to long-term peace between Canada and the United States, interrupted only briefly by raids made by political insurgents such as the Hunters' Lodges and the Fenian Brotherhood. Following the failed Rebellions of 1837, which demanded responsible government, colonial officials studied the political situation and issued the Durham Report in 1839. One goal—which proved unacceptable for the alliance of anglophone and francophone reformers that had rebelled in 1837—was to assimilate the French Canadians into British culture. The Canadas were merged into a single, quasi-federal colony, the United Province of Canada, with the Act of Union (1840). The signing of the Oregon Treaty by Britain and the United States in 1846 ended the Oregon boundary dispute, extending the border westward along the 49th parallel and ending joint occupation of the Oregon Country/ Columbia District. This led to the creation of the Colony of Vancouver Island in 1849 and, with the outbreak of the Fraser Canyon Gold Rush, the colony of British Columbia in 1858, but both were entirely separate from the United Province of Canada. By the late 1850s, leaders in Canada launched a series of western exploratory expeditions, with the intention of assuming control of Rupert's Land and the Arctic region. The Canadian population grew rapidly because of high birth rates; high European immigration was offset by emigration to the United States, especially by French Canadians moving to New England. Sir John A. Macdonald, first Prime Minister. Following the Great Coalition, the Charlottetown Conference, the Quebec Conference of 1864, and the London Conference of 1866, the three colonies—Canada, Nova Scotia, and New Brunswick—undertook the process of Confederation. The British North America Act created "one dominion under the name of Canada", with four provinces: Ontario, Quebec, Nova Scotia, and New Brunswick. After Canada assumed control of Rupert's Land and the North-Western Territory, which together formed the Northwest Territories in 1870, inattention to the Métis led to the Red River Rebellion and ultimately to the creation of the province of Manitoba and its entry into Confederation in July 1870. British Columbia and Vancouver Island (which had united in 1866) and the colony of Prince Edward Island joined the Confederation in 1871 and 1873, respectively. 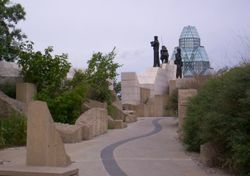 To connect the union and assert authority over the western provinces, Canada constructed three trans-continental railways, most notably the Canadian Pacific Railway, encouraged immigrants to develop the prairies with the Dominion Lands Act, and established the North West Mounted Police. As settlers went to the prairies on the railway and the population grew, regions of the Northwest Territories were given provincial status forming Alberta and Saskatchewan in 1905. 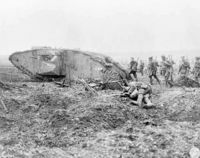 Canadian soldiers advance behind a tank at the Battle of Vimy Ridge in 1917. Canada automatically entered the First World War in 1914 with Britain's declaration of war, and sent formed divisions, composed almost entirely of volunteers, to the Western Front to fight as a national contingent. Casualties were so high that Prime Minister Robert Borden was forced to bring in conscription in 1917; this move was extremely unpopular in Quebec, resulting in his Conservative party losing support in that province. Although the Liberals were deeply divided over conscription, they became the dominant political party. In 1919, Canada joined the League of Nations in its own right, and in 1931 the Statute of Westminster confirmed that no act of the British Parliament would extend to Canada without its consent. At the same time, the worldwide Great Depression of 1929 affected Canadians of every class; the rise of the Co-operative Commonwealth Federation (CCF) in Alberta and Saskatchewan presaged a welfare state as pioneered by Tommy Douglas in the 1940s and 1950s. After supporting appeasement of Germany in the late 1930s, Liberal Prime Minister William Lyon Mackenzie King secured Parliament’s approval for entry into the Second World War in September 1939, after Germany invaded Poland. The first Canadian Army units arrived in Britain in December 1939. The economy boomed during the war mainly due to the amount of military materiel being produced for Canada, Britain, China and the Soviet Union. Canada finished the war with one of the largest militaries in the world. In 1949, the formerly independent Dominion of Newfoundland joined the Confederation as Canada's 10th province. By Canada's centennial in 1967, heavy post-war immigration from various war-ravaged European countries had changed the country's demographics. In addition, throughout the Vietnam War, thousands of American draft dodgers fled to and settled in various parts of Canada. Increased immigration, combined with the baby boom, an economic strength parallelling that of the 1960s United States, and reaction to the Quiet Revolution in Quebec, initiated a new type of Canadian nationalism. At a meeting of First Ministers in November 1981, the federal and provincial governments agreed to the patriation of the constitution, with procedures for amending it. Despite the fact that the Quebec government did not agree to the changes, on 17 April 1982, Canada, by Proclamation of Queen Elizabeth II, patriated its Constitution from Britain, thereby making Canada wholly sovereign, though the two countries continue to share the same monarch. Canada is a constitutional monarchy with Elizabeth II, Queen of Canada as head of state, and a parliamentary democracy with a federal system of parliamentary government and strong democratic traditions. Canada's constitution governs the legal framework of the country and consists of written text and unwritten traditions and conventions. 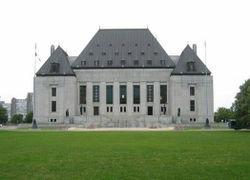 The Constitution includes the Canadian Charter of Rights and Freedoms, which guarantees basic rights and freedoms for Canadians that, generally, cannot be overridden by legislation of any level of government in Canada. It contains, however, a " notwithstanding clause", which allows the federal parliament and the provincial legislatures the power to override some other sections of the Charter temporarily, for a period of five years. The position of Prime Minister, Canada's head of government, belongs to the leader of the political party that can obtain the confidence of a majority in the House of Commons. The Prime Minister and their Cabinet are formally appointed by the Governor General (who is the Monarch's representative in Canada). However, the Prime Minister chooses the Cabinet, and by convention, the Governor General respects the Prime Minister's choices. The Cabinet is traditionally drawn from members of the Prime Minister's party in both legislative houses, and mostly from the House of Commons. Executive power is exercised by the Prime Minister and Cabinet, all of whom are sworn into the Queen's Privy Council for Canada, and become Ministers of the Crown. The Prime Minister exercises vast political power, especially in the appointment of other officials within the government and civil service. Michaëlle Jean has served as Governor General since September 25, 2005, and Stephen Harper, leader of the Conservative Party, has served as Prime Minister since February 6, 2006. Common law prevails everywhere except in Quebec, where civil law predominates. Criminal law is solely a federal responsibility and is uniform throughout Canada. Law enforcement, including criminal courts, is a provincial responsibility, but in rural areas of most provinces policing is contracted to the federal Royal Canadian Mounted Police (RCMP). Canada has a close relationship with the United States, sharing the world's longest undefended border, co-operating on some military campaigns and exercises, and being each other's largest trading partners. Canada also shares history and long relationships with the United Kingdom and France, the two former imperial powers most influential in its founding. These relations extend to other former-members of the British and French empires, through Canada's membership in the Commonwealth of Nations and La Francophonie. A founding member of the North Atlantic Treaty Organisation (NATO), Canada currently employs about 64,000 regular and 26,000 reserve military personnel. The unified Canadian Forces (CF) comprise the army, navy, and air force. Major CF equipment deployed includes 1,400 armoured fighting vehicles, 34 combat vessels, and 861 aircraft. In addition to major participation in the Second Boer War, the First World War, the Second World War, and the Korean War, Canada has maintained forces in international missions under the United Nations and NATO since 1950, including peacekeeping missions, various missions in the former Yugoslavia, and support to coalition forces in the First Gulf War. 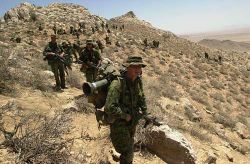 Since 2001, Canada has had troops deployed in Afghanistan as part of the U.S. stabilization force and the UN-authorized, NATO-commanded International Security Assistance Force. Canada's Disaster Assistance Response Team (DART) has participated in three major relief efforts in the past two years; the two-hundred member team has been deployed in relief operations after Hurricane Katrina in September 2005, after the Kashmir earthquake in October 2005 and after the December 2004 tsunami in South Asia. 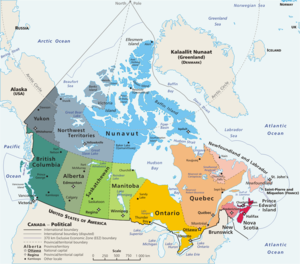 Canada is composed of ten provinces and three territories. The provinces are Alberta, British Columbia, Manitoba, New Brunswick, Newfoundland and Labrador, Nova Scotia, Ontario, Prince Edward Island, Quebec, and Saskatchewan. The three territories are the Northwest Territories, Nunavut, and Yukon Territory. The provinces have a large degree of autonomy from the federal government, the territories somewhat less. Each has its own provincial or territorial symbols. 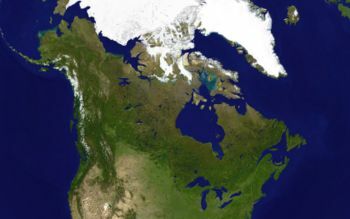 A satellite composite image of Canada. Boreal forests prevail throughout the country, ice is prominent in the Arctic and through the Coast Mountains and Saint Elias Mountains, and the relatively flat Prairies facilitate agriculture. The Great Lakes feed the St. Lawrence River (in the southeast) where lowlands host much of Canada's population. Canada occupies most of the northern portion of North America. It shares land borders with the contiguous United States to the south and with the US state of Alaska to the northwest, stretching from the Atlantic Ocean in the east to the Pacific Ocean in the west; to the north lies the Arctic Ocean. Since 1925, Canada has claimed the portion of the Arctic between 60°W and 141°W longitude; this claim is not universally recognized. The northernmost settlement in Canada (and in the world) is Canadian Forces Station (CFS) Alert on the northern tip of Ellesmere Island—latitude 82.5°N—just 817 kilometres (450 nautical miles) from the North Pole. Canada is the world's second-largest country in total area, after Russia. The population density of 3.5 people per square kilometre (9.1/ mi²) is among the lowest in the world. The most densely populated part of the country is the Quebec City-Windsor Corridor along the Great Lakes and Saint Lawrence River in the southeast. To the north of this region is the broad Canadian Shield, an area of rock scoured clean by the last ice age, thinly soiled, rich in minerals, and dotted with lakes and rivers—Canada by far has more lakes than any other country in the world and has a large amount of the world's freshwater. 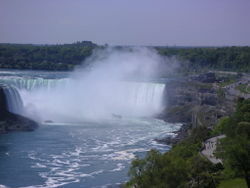 The Horseshoe Falls in Ontario is the largest component of Niagara Falls, one of the world's greatest waterfalls, a major source of hydroelectric power, and a tourist destination. In eastern Canada, the Saint Lawrence River widens into the Gulf of Saint Lawrence, the world's largest estuary; the island of Newfoundland lies at its mouth. South of the Gulf, the Canadian Maritimes protrude eastward from the Gaspé Peninsula of Quebec. New Brunswick and Nova Scotia are divided by the Bay of Fundy, which experiences the world's largest tidal variations. Ontario and Hudson Bay dominate central Canada. West of Ontario, the broad, flat Canadian Prairies spread toward the Rocky Mountains, which separate them from British Columbia. Average winter and summer high temperatures across Canada vary depending on the location. Winters can be harsh in many regions of the country, particularly in the Prairie provinces, where daily average temperatures are near −15° C (5° F), but can drop below -40°C (-40°F) with severe wind chills. Coastal British Columbia is an exception and enjoys a temperate climate with a mild and rainy winter. Canada is one of the world's wealthiest nations with a high per capita income, a member of the Organisation for Economic Co-operation and Development (OECD) and Group of Eight (G8). Canada is a free market economy with slightly more government intervention than the United States, but much less than most European nations. Canada has traditionally had a lower per capita gross domestic product (GDP) than its southern neighbour (whereas wealth has been more equally divided), but higher than the large western European economies. For the past decade, after a period of turbulence, the Canadian economy has been growing rapidly with low unemployment and large government surpluses on the federal level. Today Canada closely resembles the U.S. in its market-oriented economic system, pattern of production, and high living standards. While as of October 2006, Canada's national unemployment rate of 6.3% is among its lowest in 30 years, provincial unemployment rates vary from a low of 3.6% in Alberta to a high of 14.6% in Newfoundland and Labrador. In the past century, the impressive growth of the manufacturing, mining, and service sectors has transformed the nation from a largely rural economy into one primarily industrial and urban. As with other first world nations, the Canadian economy is dominated by the service industry, which employs about three quarters of Canadians. However, Canada is unusual among developed countries in the importance of the primary sector, with the logging and oil industries being two of Canada's most important. Canada is one of the world's most important suppliers of agricultural products, with the Canadian Prairies one of the most important suppliers of wheat and other grains. Canada is the world's largest producer of zinc and uranium and a world leader in many other natural resources such as gold, nickel, aluminium, and lead; many, if not most, towns in the northern part of the country, where agriculture is difficult, exist because of a nearby mine or source of timber. Canada also has a sizeable manufacturing sector, centred in southern Ontario and Quebec, with the automobile industry especially important. The 2001 national census recorded 30,007,094 people; the population is currently estimated by Statistics Canada to be 32.623 million people. Population growth is largely accomplished through immigration and, to a lesser extent, natural growth. About three-quarters of Canada's population live within 160 kilometres (100 mi) of the U.S. border. A similar proportion live in urban areas concentrated in the Quebec City-Windsor Corridor (notably the Golden Horseshoe, Montreal, and Ottawa metropolitan areas), the BC Lower Mainland (Vancouver and environs), and the Calgary-Edmonton Corridor in Alberta. Toronto, Ontario is one of the world's most multicultural cities. Canada is an ethnically diverse nation. According to the 2001 census, it has 34 ethnic groups with at least one hundred thousand members each. The largest ethnic group is "Canadian" (39.4%), followed by English (20.2%), French (15.8%), Scottish (14.0%), Irish (12.9%), German (9.3%), Italian (4.3%), Chinese (3.7%), Ukrainian (3.6%) and First Nations (3.4%). Canada's aboriginal population is growing almost twice as fast as the rest of the Canadian population. In 2001, 13.4% of the population belonged to visible minorities. In comparison with most developed countries, Canada maintains a relatively high immigration rate. 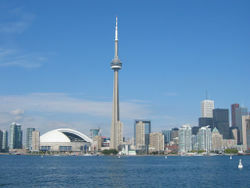 Immigrants are particularly attracted to the major urban areas of Toronto, Vancouver and Montreal. Canadians adhere to a wide variety of religions, as people in Canada have the freedom of religion as one of their rights. According to 2001 census, 77.1% of Canadians identified as being Christians; of this, Catholics make up the largest group (43.6% of Canadians). The largest Protestant denomination is the United Church of Canada; about 16.5% of Canadians declared no religious affiliation, and the remaining 6.3% were affiliated with religions other than Christianity, of which the largest is Islam. 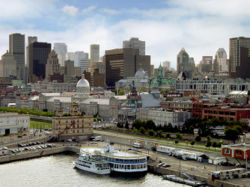 The population of Montreal is predominantly francophone, with a significant anglophone community. Canada's two official languages, English and French, are the mother tongues of 59.7% and 23.2% of the population, respectively. On July 7, 1969, under the Official Languages Act, French was made commensurate to English throughout the federal government. This started a process that led to Canada redefining itself as an officially " bilingual" nation. French is mostly spoken in Quebec, but there are substantial francophone populations elsewhere, mainly in the northern parts of New Brunswick, eastern, northern and southwestern Ontario, and southern Manitoba. Of those who speak French as a first language, 85% live in Quebec. Ontario has the largest French population outside Quebec. French is the official language of Quebec; New Brunswick is the only officially bilingual province in the country. No provinces other than Quebec and New Brunswick have constitutionally official language(s) as such, but French is used as a language of instruction, in courts, and other government services in all of the majority English or Inuktitut speaking provinces and territories. In Ontario, French has some legal status but is not fully co-official. Several aboriginal languages have official status in Northwest Territories. Inuktitut is the majority language in Nunavut, and one of three official languages in the territory. 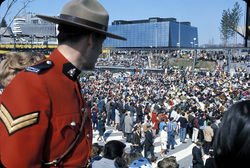 The Royal Canadian Mounted Police, seen here at Expo 67, are the federal and national police force of Canada and an international icon. Canadian culture has historically been heavily influenced by English, French, Irish, Scottish and Aboriginal cultures and traditions, and over time has been greatly influenced by American culture because of its proximity and the interchange of human capital between the two countries. Many forms of American media and entertainment are popular, if not dominant in Canada; conversely, many Canadian cultural products and entertainers are successful in the US and worldwide. Many cultural products are now marketed toward a unified "North American" market, or a global market generally. The creation and preservation of distinctly Canadian culture has been partly influenced by federal government programs, laws and institutions such as the Canadian Broadcasting Corporation (CBC), the National Film Board of Canada (NFB), and the Canadian Radio-television and Telecommunications Commission (CRTC). As Canada is a geographically vast and ethnically diverse country, there are cultural variations and distinctions from province to province and region to region. Canadian culture has also been greatly influenced by more recent immigration of people from all over the world. Many Canadians value multiculturalism, indeed some see Canadian culture as being inherently multicultural. Multicultural heritage is enshrined in Section 27 of the Canadian Charter of Rights and Freedoms. Canada's official national sports are ice hockey (winter) and lacrosse (summer). Hockey is a national pastime, and is by far the most popular spectator sport in the country. It is also the most popular sport Canadians play, with 1.65 million active participants in 2004. Canada's six largest metropolitan areas - Toronto, Montreal, Vancouver, Ottawa, Calgary, and Edmonton - have franchises in the National Hockey League (NHL), and there are more Canadian players in the league than from all other countries combined. After hockey, other popular spectator sports include Canadian football and curling. The Canadian Football League (CFL) is the nation's second most popular professional sports league, and plays a large role in Canada's national identity. Golf, baseball, skiing, soccer, volleyball, and basketball are also widely played at youth and amateur levels, but professional leagues and franchises are not as widespread. Canada will host the 2007 FIFA U-20 World Cup, and the 2010 Winter Olympics in Vancouver and Whistler, British Columbia. Canada was ranked number one country by the United Nations' Human Development Index 10 times out of 16 between 1980 and 2004.